This surgical side rail clamp can be attached to virtually any operating table. 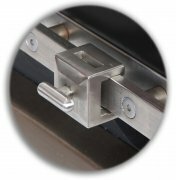 Easily attaches to any standard surgical table side rail. Provides a simple and quick method for attaching and removing surgical accessories. The solid construction of stainless steel ensures a long useful life. Accepts standard flat bar accessories that measure 1" x 1/4"